Canggu, a Mecca for digital ‘nomads’, that cease to be nomads and settle down into the Instagrammable lifestyle of this beachy area of Bali. We accidentally stayed in Canggu for a week, and didn’t realise quite how much time had passed when we eventually moved on. I feel like Canggu is something of a time warp, where everything moves slowly but time moves quickly. Okay, that probably doesn’t make sense. Basically, a lot of time can pass without much really being achieved, making it the perfect place to fully chill. This is exactly what we needed after a non-stop week in Ubud. When in Canggu, one wakes up in the morning to such pressing questions as “is this going to be a beach club day or a productive day?” If the latter, then “where to take photos of my breakfast this morning?”, “do I go surfing or get a massage?”, then “where to take photos of my lunch?”, “which aesthetic spot should I choose for a little bit of laptop club?”, “yoga or gym?”, and finally, “which beach shall we watch the sunset from and where’s tonight’s party?” Canggu is the place where lifestyle goals are made and work is never achieved. Maybe I’m wrong, but this was my experience, and I loved it. Anyway, of the few ‘activities’ that I did do, I have compiled a list of my top Canggu secrets. These will cover two posts, of which this is number one. For now, let me tell you about the most aesthetic places to stay (including a hostel!) and some of the yummiest vegan food Elise and I found in Canggu. Okay, so we stayed in two places over the week we spent in Canggu. We splashed out a bit on one (though we were generously given a discount in exchange for content): Villa Mar is truly gorgeous. 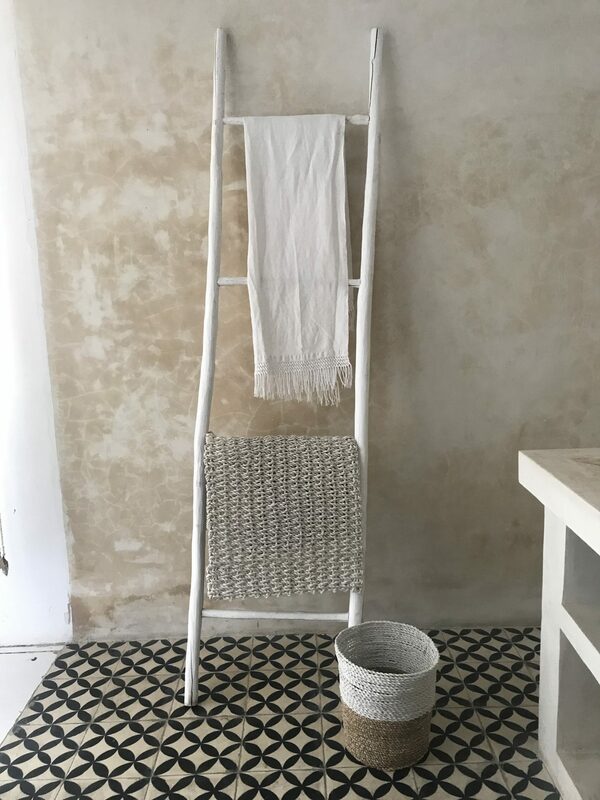 This private room in a shared villa just outside the busier centre of Canggu is the very definition of Scandinavian style with Balinese twists thrown in. This is the perfect spot for content-creators, photographers or simply those with a love for the beautiful and pristine. 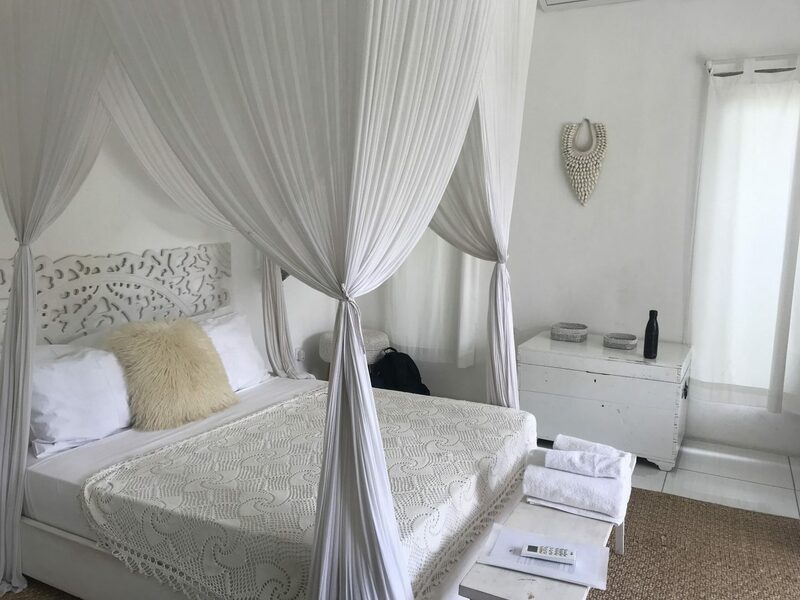 Whilst their Instagram gives testament to the aesthetic appeal of this place, I can also tell you that the owner and housekeeper of this property are super lovely too and keen to make your stay as chilled as the Canggu atmosphere. Treat yourself to a couple of nights in this pretty little space and cook your own fresh food in their exposed-concrete, outdoor kitchen. Take the term ‘hostel’ with a pinch of salt here, for Kosone was unlike any hostel I’ve ever seen before. Even following Ubud’s super lovely Puri Gardens! Kosone is a resort with its vast pool, pool bar, water slide, diving ledge, pastel designs and live pool party DJs. On every morning that we woke up in this place and headed down to the gym (access included in the room price), we would watch model after model and photographer after photographer make the most of the luxurious aesthetic of this hostel/resort. I can’t work out if this made me want to give up trying at the gym, or push myself to dangerous lengths… these girls are literally the Bali Body babes you see sprawling out over Instagram. Complete with cafe, beautiful pool, gym and uber clean facilities, Kosone seems to have taken on the role of the digital nomad’s temporary/semi-permanent home. With a delicious and extensive breakfast menu as an optional extra to the room cost, many residents eat smoothie bowls and drink iced lattes with their laptops until around 11am when the working day seems to unofficially end. I think this is coming across in a bit of a sarcy manner, but I can assure you, Elise and I most certainly joined this group for the time we spent there. Pay a little more than you might at a different hostel, and stay at Kosone if you’re looking to meet like-minded digital creatives, a luxurious ‘hostel’ experience, and easy access to the central areas of Canggu or its many beach clubs and party locations. 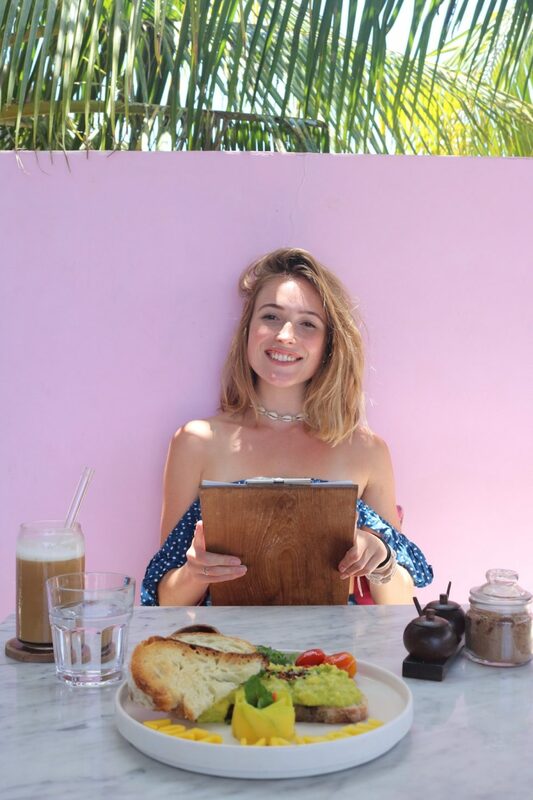 Okay so this list most certainly isn’t exhaustive… I don’t know if it would even possible to write a complete vegan food guide to Canggu, and if it has been done, it’ll be out of date by next week. This is a vegan heaven on the rise. But I’ve included a couple of spots that I managed to try and loved. We were fortunate enough to join a friend of ours who was invited to spend 100 Euros here so we had food enough to entirely cover several tables… this was a feast shared between just four and ohhhhh it was good. 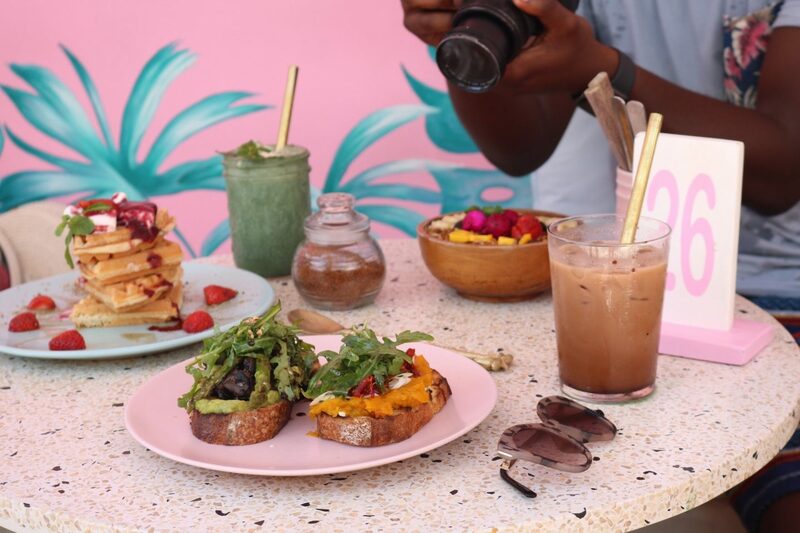 The Strawberry Fields menu is eclectic, ranging from meaty burgers to totally plantbased smoothie bowls and curries… this is the perfect spot to head if you’re a group of mixed eaters as we were. Elise and I devoured smoothies, yellow curry, smoothie bowls, pumpkin salads and raw rice paper wraps, whilst our friends enjoyed eggs, burgers, and the most outrageous freakshakes I ever did see. Head here for big group meals, breakfast lunch or dinner and be ready to overeat. 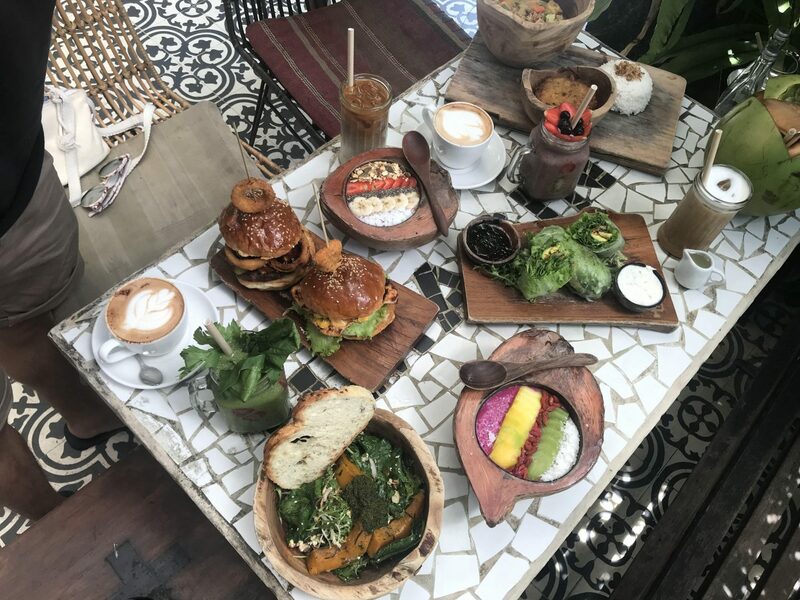 This 100% plant-based, Instagram-worthy gem is the sister restaurant to the infamous Seminyak foodie paradise, Kynd Community. (Seminyak is super close to Canggu and the cover photo of this blog is from Kynd Community, so I would totally suggest heading over that way… Seminyak has a whole lot to offer too.) What’s so fab about Give Cafe is its extensive offering of veganized local food. Vegan food in Bali is so often limited to the western options of avo toast, pancakes, etc. At Give Cafe, they have a great buffet of veganized local dishes to choose from. Elise and I chose a vegan Nasi Goreng, complete with fried veggie rice, ‘prawn crackers’ and a vegan fried egg. The latter was questionable to be honest… but it was refreshing to be able to experience this classic local dish without fear of accidental fish sauce or chicken. Give Cafe is also really aesthetic which is always a plus, and makes for a super chilled place to grab a coconut and chat with friends, post-hard-working-morning. Another all-veggie menu, I had my very first vegan scrambled tofu-eggs here and actually genuinely enjoyed them. Okay, so it doesn’t really taste like eggs, but it was yummy all the same. This place is a hotspot for the beautiful Bali expats of Aus and America… the short time we spent here I think I saw the most beautiful girl in the world AND she had a pet kitten that went everywhere with her… GOALS?! The Shady Shack is perfect for a little hangover morning revival and chillout. It is the place to go for a foodie detox of veggies and fresh fruit smoothies. I didn’t manage to get photos at the following, but rest assured, they were oh sooooo good. Lola’s Cantina Mexicana: This place had the most INCREDIBLE vegan burrito with cashew cheese and veggies and so much yumminess. Also a super good sangria. The Loft: (there is also one of these in Uluwatu which I will write about in due course.) 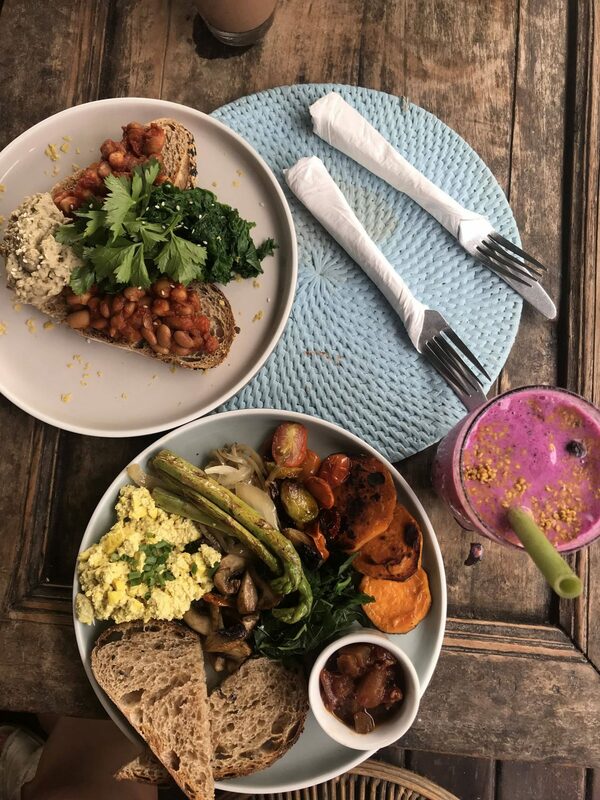 A fab spot for vegan brekkie, lunch or dinner. Plant Cartel: Unfortunately I only ate here when I was slowly getting over being sick so didn’t fully get to experience its big old menu. But the interior was lovely and the food looked delish. The Avocado Factory: I mean, it’s exactly what it says on the tin. If avo is your thing (as it is mine and every other cliche ‘digital nomad’ out there), then head here for some avocado creativity. 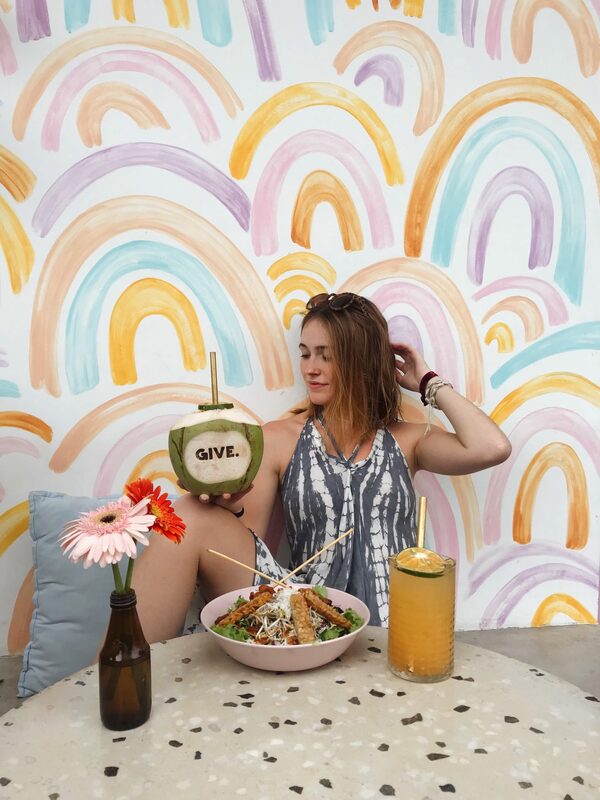 Obviously I’ve not covered all bases of Canggu, with so many more foodie spots, elegant fashion boutiques and seriously beautiful villas, I would so love to experience a life here if money were no object, but hey, that’s just not the case. But hopefully this shows that the budget-version can be pretty dreamy too… I mean, Kosone is a hostel, whaaaat!? Okay, so this was part one of my Canggu Secrets and in my next post I’ll be covering where to work and where to play in Bali’s digital-nomad haven. I repeat, be sure to check out the foodie plentitude of Seminyak too. 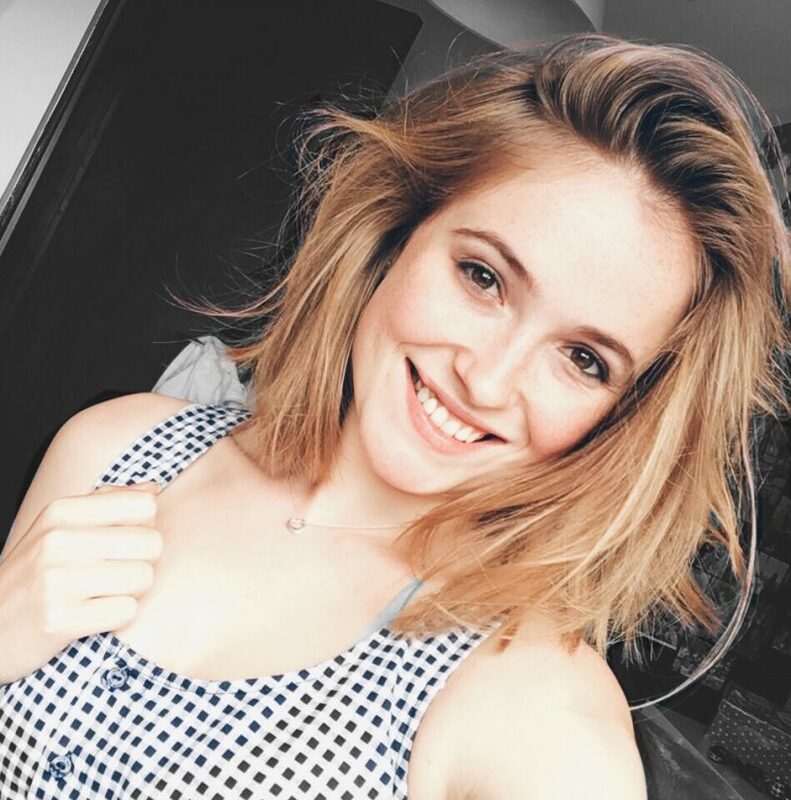 Previous Post Working Whilst Travelling Is HARD. That’s okay.